The nice people at LoveKnitting sent me some yarn to try out. Yay! Yarn! What I received in the mail yesterday was three balls yarn from their Scandinavian line, MillaMia. The yarn is Naturally Soft Cotton, it comes in 50 gram balls, a it is a sport weight yarn. The weather just got as hot as blazes around here in Pennsylvania, and I like to use cotton yarn during warm weather, so I was glad to see this yarn. Secondly, I dig the colors I was sent, too. I’m not normally a yellow person, but this is a nice yellow. It’s called Lemon Yellow, the orange is Tomato, and the red is Bright Red. First impressions? Nice yarn! It’s soft, the colors are bright, and it seems to be well made. But, how does it knit? That’s the important question. So far, it knits quite beautifully! I am only a few rows into a simple lacy shawl, The Tuscon Lattice Shawl from One Skein Designer Wonders. I have knit this shawl quite a few times. It’s easy to memorize. With the colors I was sent, I had an idea as to how to incorporate them into the shawl. When it’s done, I’ll share what I did, of course, but for now, here’s a sampling of what I’ve done so far. To start with, the yarn seems to have decent stitch definition, and isn’t too slippery to use or splits, like some cotton yarns tend to do. I probably will some yarn left over from the shawl, so I’ll be able to put the yarn through paces with other projects, maybe something with crochet. I could see this yarn making lovely dishcloths and only getting softer with use. MillaMia Naturally Soft Cotton is a Swedish wonder! I like it! 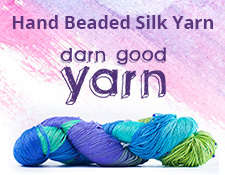 Check out LoveKnitting and see what other great yarns and patterns they have. You can also share your projects, and learn new techniques. It’s a great one-stop experience for any knitter. Sometimes I like to mix things up and do a little crochet for a while. This past weekend I was crocheting like a mad woman! I finished the above elephant, yes, that’s what it’s supposed to be, and did another project, too. What really inspired me to do this was to up my crochet game a little bit. I wanted to learn mostly how to decrease and increase stitches. I did accomplish decreasing with said elephant above. I learned that from an impulse buy magazine that I got at the grocery store check out line. It’s simply called “Crochet” and is put out by PIL. It’s actually a pretty decent book! It takes you through the basic techniques of crochet, and gives you eleven projects you can do with your newly learned skills. The elephant is one. Yeah, he’s over stuffed, but he’s cute. I like this stuffie! Now, I’m suddenly interested in amigurumi. Second, I did a case for my Nintendo 2DS, using the tablet case pattern from the above book. I just didn’t do the cool chevron pattern repeat as much, since my 2DS is a bit smaller than a tablet. So, that’s what I accomplished over the weekend! Crocheting is always a nice change of pace for me, since I’m still pretty much learning the basics of it. It’s fun! My stuffies are done! Rather than got through the frustration of embroidering on their features, as the pattern called for, I decided to go a different route. Either way, say hello to my stuffies WITH faces above! Looking at the photo, you can tell what I did. I got some pom poms, and grabbed my fabric glue. Boom! My stuffies came alive with their facial features. As a side note, I’m was holding my dog back as I was taking the photo for this post. He loves stuffed toys, and enjoys eviscerating them with glee. Sorry, boy, these aren’t for you! So, that’s the end of my stuffie saga. If you’d like, catch up on the rest of the story here and here. And, to conclude, the pattern for these critters comes from Annie’s Knit Animal Friends, and you can get it for Kindle over on Amazon.